Nice ability to scan bar codes. Qr Droid works better than the recommended app. Also when setting QR Droid to the default app to scan bar codes, Mighty Grocery still asks what bar code scanner to use every time. Greg, thanks for your feedback. Please note that setting a default app to perform scanning is a feature of Android Operating System. If it does not work as you expect, try rebooting your handset. If this does not help, you may need to remove other scanning app so that your preferred app would be the only option. I would like to be able to store multiple prices (for different shops) per single barcode item, so I could scan the barcode at Jake’s and see if the associated item is cheaper than at Mary’s. Is this possible with MG? Wojtek, thanks for your question. Unfortunately, this does not seem to be feasible at the moment. We will plan this as a part of multi-store support going forward. I have owned the app for 2 years and I still can’t use it. Scanning bar codes is still too ponderous. Alex, you mentioned multi-store support. We must be able to set up a set of isles differently for each store. There may be some who can take a general list from store to store, but they are laid out so completely differently that this is difficult. As mentioned by Wojtek, we need to have a completely different set of data for each store: Isles, bar codes, prices, etc. Setup will be time-consuming, but once set up it will be much more functional. Doug, thanks for your feedback. As you may know, there is support for multiple lists in Mighty Grocery. 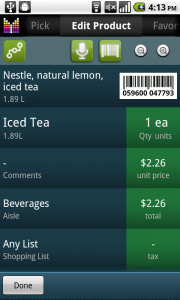 It is possible to create a list for each store and manage inventory and aisles separately. The best way would be creating List-specific Favorites lists and populate them separately for each store. We still have plans for better support of multiple stores in the future, but unfortunately there is no specific timeline yet. Wonderfull so far, your app works perfectly with QR Droid App for barcode scanning, sadly i had to install the recommended barcode scanner befor i got an option to choose. Only thing im really missing is to be able to enter barcodes by Hand instead of scanning them, some packages have the barcode horribly placed so its almost impossible to scan them. Mike, thanks for your feedback. We have plans to allow entering barcode going forward. As there’s not much MG users in Poland I didn’t expect to get many polish barcodes from MG database. I always publish codes that I scan but the problem is that these codes aren’t published :/ Me and a few of my friends have this app, let say that I’ve scanned some product, added all data and published. Now, after one or two weeks my friend is trying to scan the same product but still MG isn’t able to find it in the database. I also changed my phone few weeks ago, needed to reinstall MG, then I’ve tried to scan the same products that I’ve scanned before and I had to fill all data again :/ Does this function (publishing) already works or it’s just on todo list? Vacu, thank you for your question. 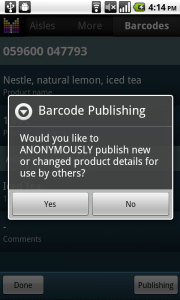 Unfortunately, sharing barcodes between users is not available yet. We are collecting published data and plan to make it available going forward. However, all barcodes you scan should be saved in your backup. Have you tried restoring backup before scanning on your new phone? I put this in the forum, but after 5 days the admin still didn’t approve it. WHY? 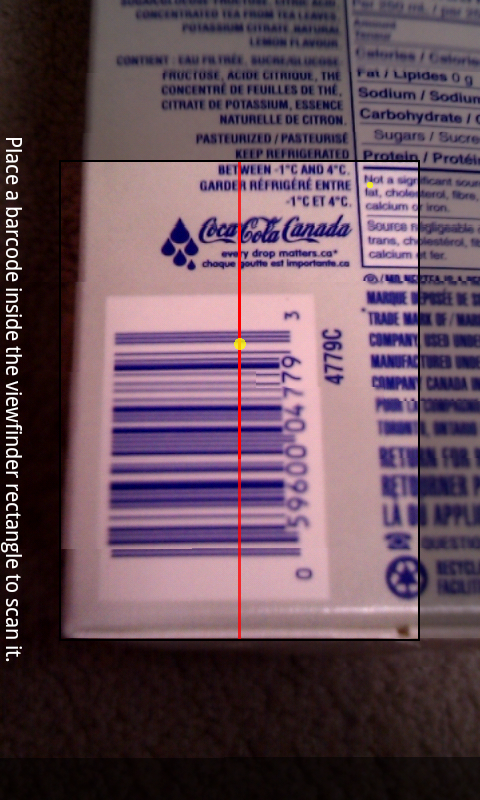 I scanned a bar code with a currently open item by mistake. The app won’t let me delete it so I can scan it as a new item, it keeps bringing up the error record. I’ve tried to delete the history, and other occurrences of it, but keeps coming up as the error record. How can i get rid of the error’d record so the scan code will bring up the correct item? Sorry about delay. Sometimes forum posts take a while to respond. Contacting via email (hi@mightypocket.com) is the most efficient way to get help. Most likely you need to find this item in Setting > Pick list > Edit item > tap barcode > Clear. Or you could find the item in question under More > Search using text search. 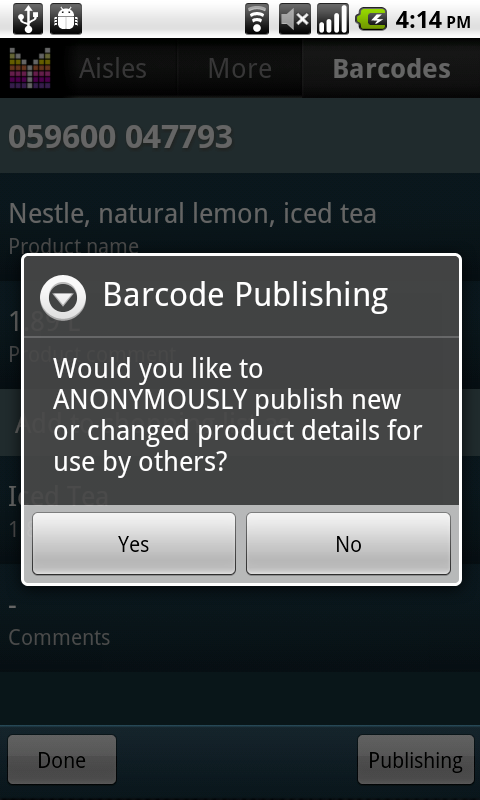 Try searching by barcode too. Quick Question. I barcode scanned an item into “My Pick List”. In the Pick List, I changed the name/details. When I scanned the item into my Grocery List the original barcode name showed on the confirmation screen, but when I confirmed the scan, the Pick List name was in the Grocery List. I then changed the name in the Barcode List, but it didn’t change the Pick List. 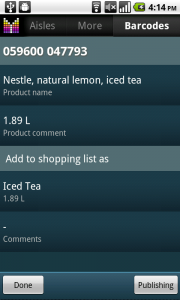 When I edited the name in the Grocery List, it displayed the Barcode List entry, but the edit only changed the Grocery and Pick List entries. Is there a way to propagate changes or do I need to update both lists (Pic List and Barcode List) or am I using it wrong? Thanks. When you scan an item under Pick list, there are two records created: 1) Barcode scan record with product name and description; 2) Product record that is listed in Pick list. 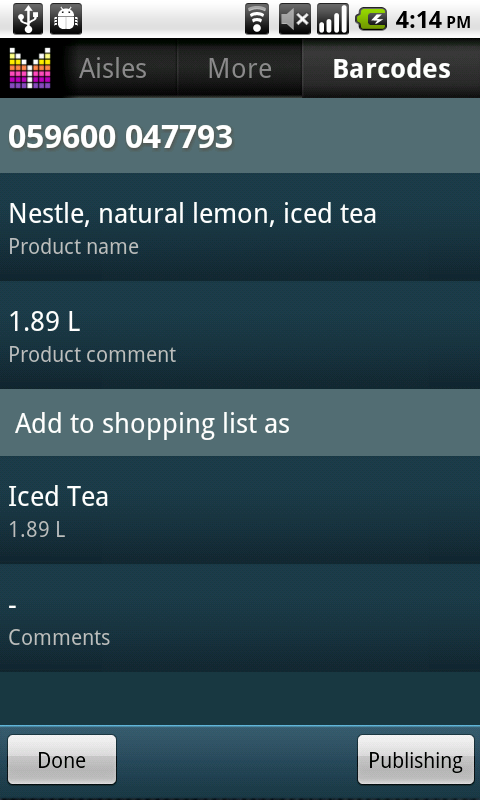 When you scan the same product in shopping list, the app tries to find a record in Pick list and uses it. When you change the name of your shopping item (or product under Pick list), this is not considered as a change to the Barcode scan item. 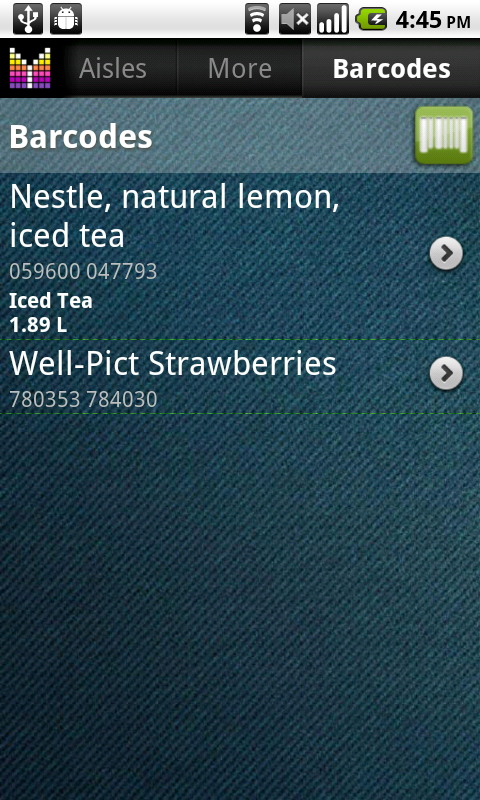 Therefore you’ll need two edits if you’d like to change shopping list item and barcode scan item. 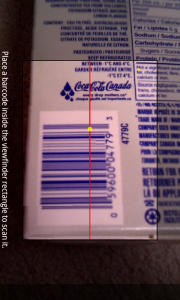 Great App, but it’s the same for me with the barcode scanner. I don’t have an autofocus camera, so the only bc scanner app i know that works with my phone is pic2shop… would be great if it would be possible to choose the scanner app. Hi Bam, thanks for your feedback. 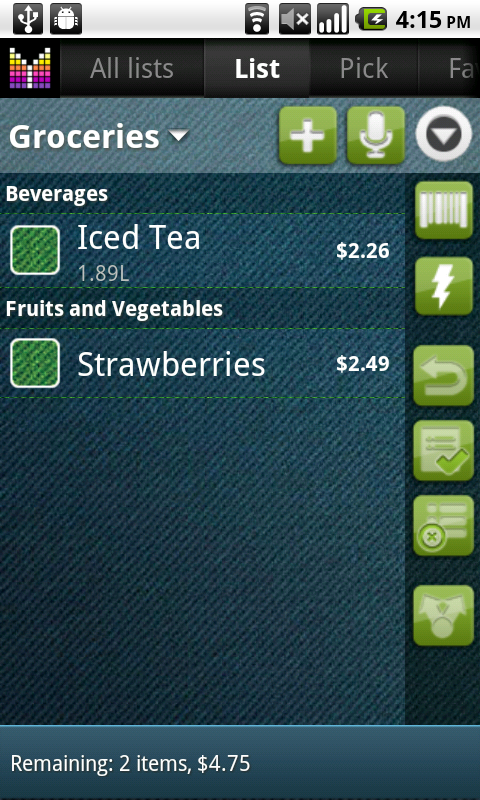 We have plans on integrating with other barcode scanner apps. Hopefully they will be willing to cooperate going forward. Thanks again. I also have a Samsung Galaxy S II and the secret to getting the scanner to work is to take off autofocus. It then will work perfectly. Thanks. I tried that and it did not work. 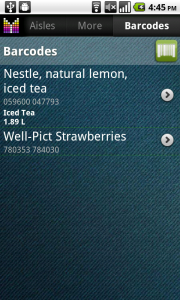 However, uninstalling and reinstalling the grocery and sccanner apps seemed to do the trick. 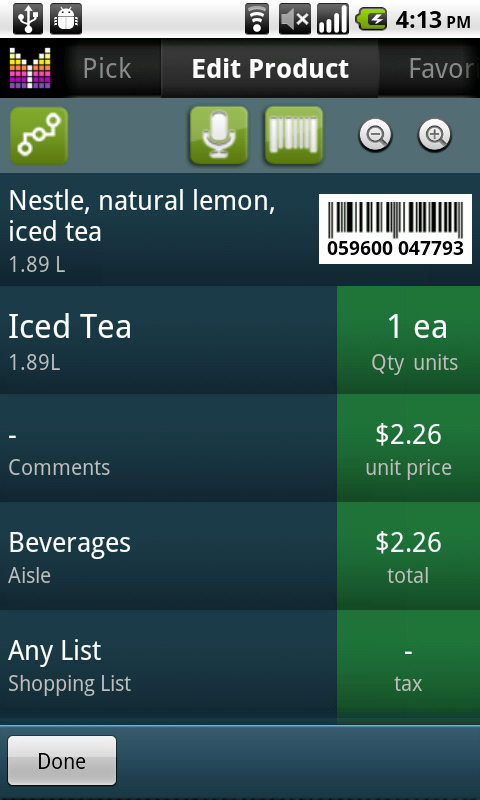 I absolutely love this app and use it nearly every day. However, if I had one complaint, it would be the barcode scanner — epic fail! It won’t detect anything I try to scan. 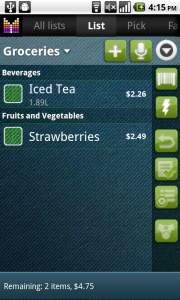 I have other barcode scanners on my phone (Samsung Galaxy SII) and within other apps, and they’ll scan flawlessly within nanoseconds, but the one with Mighty Grocery has never worked for me. Please fine out which one MyFitnessPal uses and use that one; it never fails.